An illustration of the newly discovered gas giant exoplanet, 51 Eri b, by artist Danielle Futselaar and Franck Marchis of the SETI Institute. The planet orbits the bright star in the middle of the image, which has a pair of distant, dimmer, companion stars, shown in the upper left. Astronomers have found thousands of planets outside our solar system. Almost all of these exoplanets were detected by measuring periodic changes in the light from their stars. 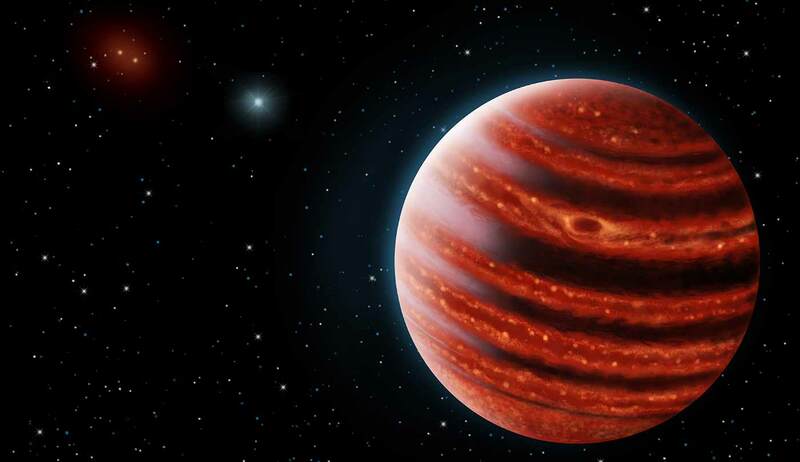 A newer approach subtracts starlight from the astronomers’ view revealing a direct image of the planet itself. The light from the planet, really the glow of its atmosphere, can indicate temperature and composition, clues to how the planet formed. “We’re actually taking pictures of planets, rather than inferring that they’re there,” said Quinn Konopacky, an assistant professor of physics and member of the Center for Astrophysics and Space Sciences at the University of California, San Diego. Light from the star is blocked and filtered out in this photograph taken by the Gemini Planet Imager revealing the planet 51 Eri b, visible as a bright spot below and a little to the left of the central white mask. Image processed by Julien Rameau, University of Montreal, and Christian Marois, NRC Canada. Konopacky is part of a large team of astronomers who developed and deployed the Gemini Planet Imager, an instrument that adaptively measures moving starlight. Her main role is to calibrate the instrument to optimally measure the separation between the light from the star and the planet. 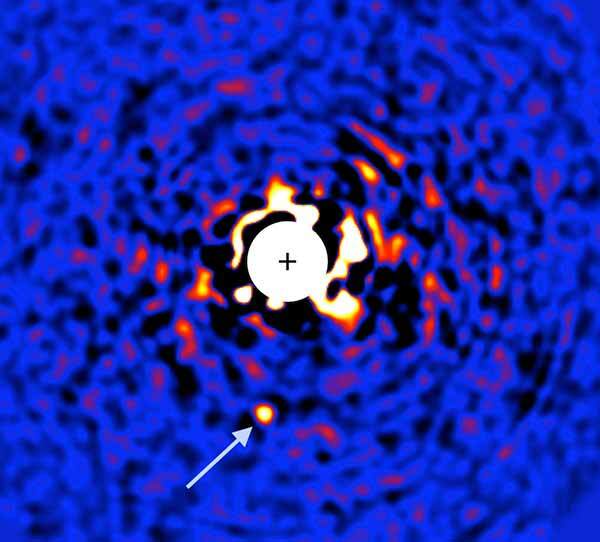 Using the Gemini Planet Imager, mounted on the Gemini South telescope in Chile’s astronomical reserve, the team spotted the planet orbiting at about the same distance from its star as Saturn does from the Sun. They report the discovery and describe the planet’s atmosphere in a paper published online by Science this week. The newly discovered planet orbits 51 Eridani, a nearby star a lot like our own, though brighter and much younger, just 20 million years old. And the planet, called 51 Eri b, is like a young Jupiter, a gas giant about twice Jupiter’s mass but hotter and even younger than its star. So in a way, 51 Eridani is an earlier version of a part of our solar system. A closer look could help us understand how planetary systems like ours form. The star 51 Eridani’s position near the constellation Orion appears first. Zooming in, we see two rings of rocky debris surrounding the star. Between the inner and outer debris rings, the newly discovered planet appears, glowing with heat through belts of clouds. The view spins to look back at the planet’s star, then rotates back to a view of our own Sun, a yellow dot a hundred light years in the distance. Animation by Jennifer Patience and James Cornelison, Arizona State University, art by Danielle Futselaar and Franck Marchis, SETI Institute. Light broken into its component wavelengths, a spectral analysis, can reveal the chemistry of the matter it passes through. The glow of 51 Eri b’s atmosphere bears the imprints of water vapor and methane, evidence that it has cooled enough for molecules to have formed, though it’s still quite warm. Additional measures of its light revealed a temperature of about 700 degrees Fahrenheit, hot enough to melt lead. These observations mean that 51 Eri b could have formed in a process known as “cold start” in which dust gathers first and accretes to a solid core until it reaches a sufficient mass to sweep in gases. A competing scenario, known as “hot start” has both dust and gas coalescing together, which would produce planets that are brighter at young ages. Further observations, including precise measurement of the planet’s orbit, will reveal more about 51 Eri b and its history. The Gemini Planet Imager was designed specifically for discovering and analyzing faint, young planets orbiting bright stars. A team of more than a hundred scientists led by Bruce Macintosh at Stanford University and James Graham at UC Berkeley, continues to search for additional planets around 600 nearby stars. The National Science Foundation and NASA provide major funding for the Gemini Planet Imager Exoplanet Survey.